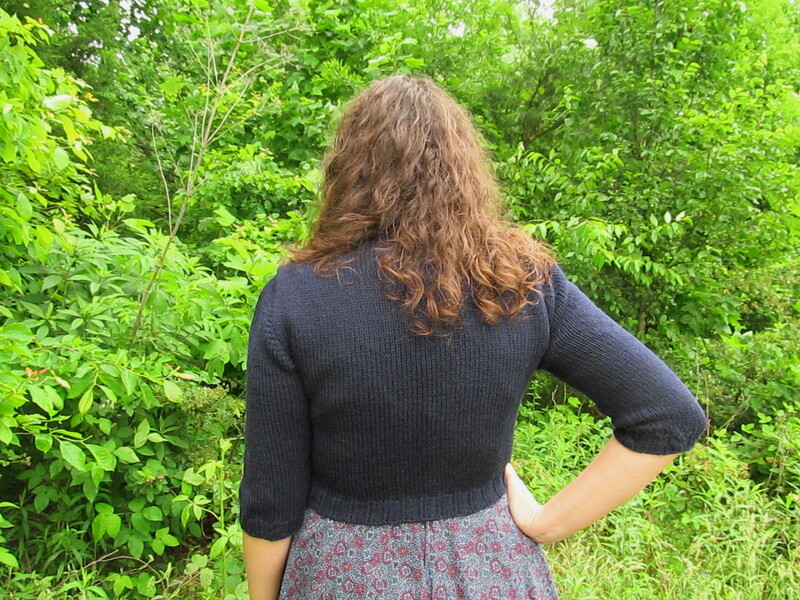 Wool and Wheel: Knitting: navy Marion cardigan (plus a dress). I've only had this cardigan finished since the beginning of February. February! I have no idea why it has taken me three and a half months to finally get pictures of it. It was 90 degrees over the past few days (yuck! I'm not ready for Virginia summer), but thankfully today was cool and damp so I could squeeze in another wearing of this sweater before packing it away until fall. The pattern is Marion, by Andi Satterlund. This was one of the first sweater patterns I ever wanted to knit...I added it to my queue years ago. I bought the pattern three years ago, and I always pictured knitting it in some shade of blue because the cables reminded me of nautical ropes. When I needed a navy sweater to wear over some sleeveless dresses I'd sewn, this seemed like the perfect time to finally knit Marion! 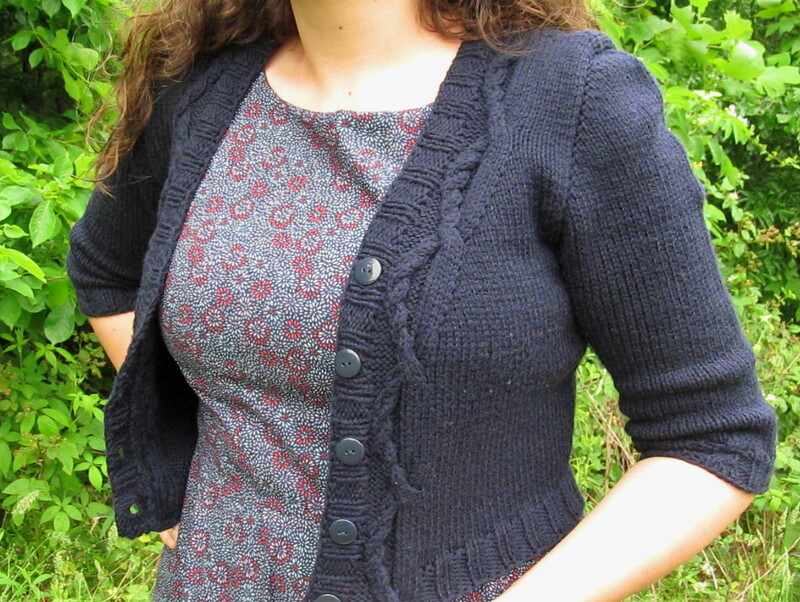 I'd previously knitted one of this designer's sweaters, Miette, which is a pretty basic pattern. But because of some fit adjustments, I had to do a lot of tweaking and reworking with that one. Thankfully things went much smoother with Marion. The only thing I changed was to make the body and sleeves slightly shorter. This sweater was made specifically to wear over dresses, and there's a particular length I want for that. I used Quince and Co.'s Lark yarn in the Pea Coat colorway. I love that their yarn is made with American wool and it's pretty soft. The only thing is that sometimes it has a strange stiffness to it, almost like cotton. Also, as you can tell in some of the pictures, it is already starting to pill in spots. 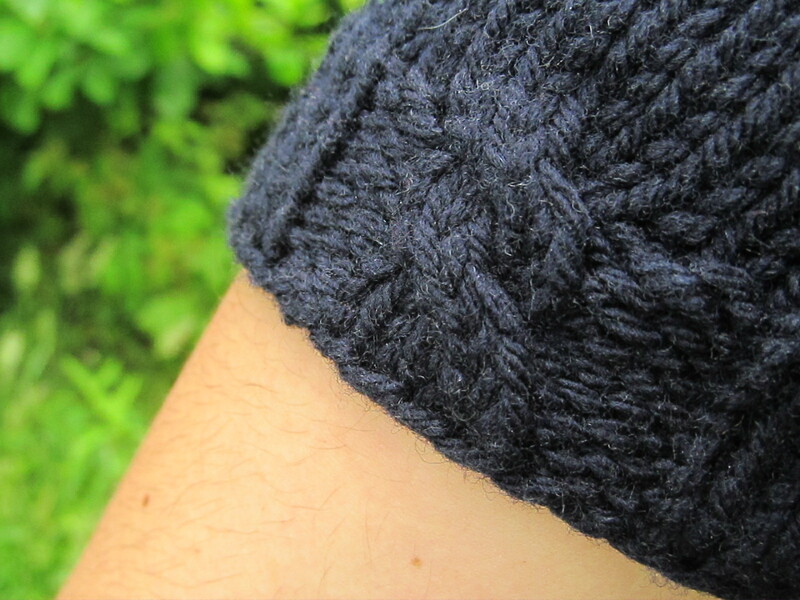 I do think this yarn shows off cables really well though...and even though they're subtle, I especially love the little cables knit into the ribbing on the sleeves. You might remember that I got obsessed with the thought of using a certain type of vintage buttons on this sweater. I only had two, but I found some more on Ebay and ordered them. They seemed to be a perfect match...until you got in sunlight, when it was obvious that my two were navy and the others were a brighter blue that clashed with the sweater. So sadly I just had to settle for plain new plastic navy ones. 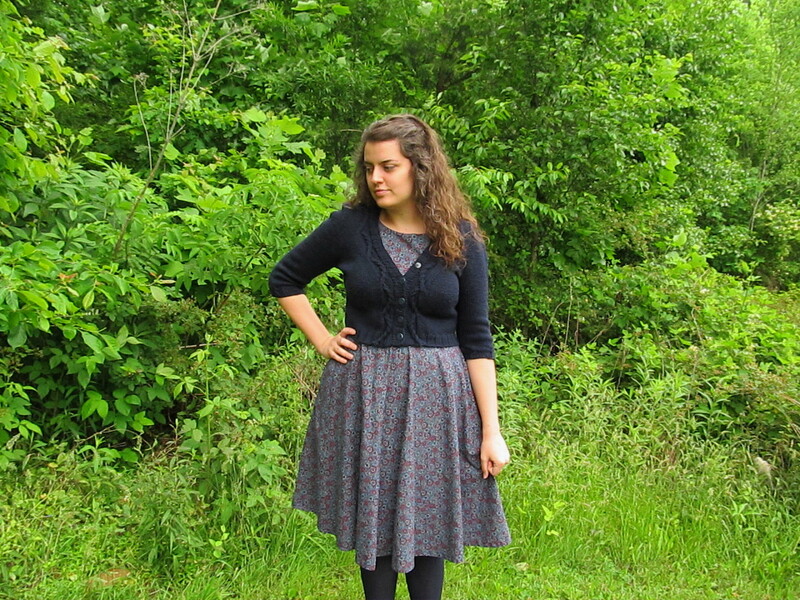 One more thing...this is a dress that I sewed at the end of last summer and never blogged about! It's the same pattern as the others I made last year, nothing special. The fabric is just basic cotton from Joann's. I think it's supposed to be a floral, but up close the print reminds me of fireworks and I liked that. But see that crease across the neckline? Obviously I still haven't got the fit perfect. 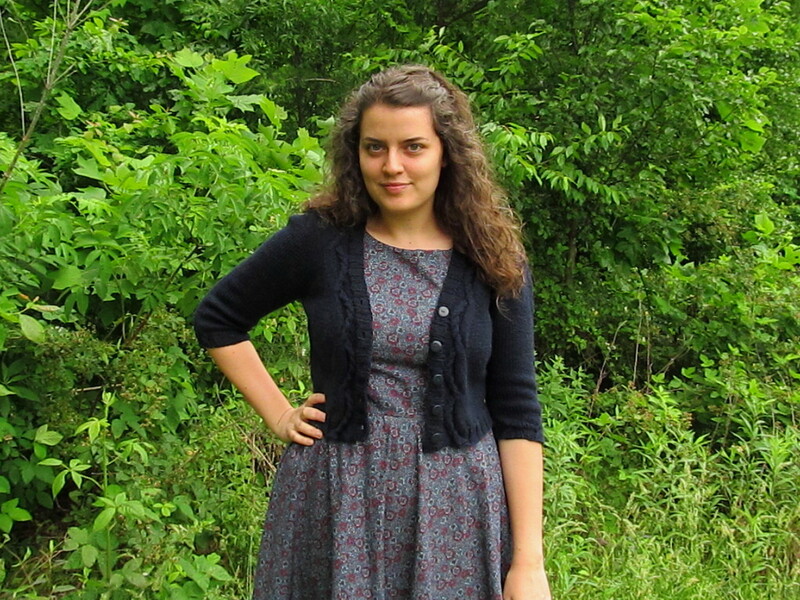 Beautiful, both the dress and the cardigan! One of my goals this year is to learn to sew and a dress is one of the thing I hope to be able to make.